Kate and Oli: Recap To End All Recaps! Ohmigosh. What a long posting break. I'm a bad blog owner, but you have to forgive me because it's the holidays and because I am apologizing by having a giveaway! More details on that later; for now, here's what's been happening. Last Tuesday, my dad had a cardiac catheterization. They found out that one of the three main arteries to his heart was 80% blocked, so they put in a stent to keep it clear. He came home from the hospital on Wednesday morning and Wednesday and Thursday were looooong days of catch-up at work. Since it's been so long, this could be a really long, detailed post, so I'll keep it to the main points. 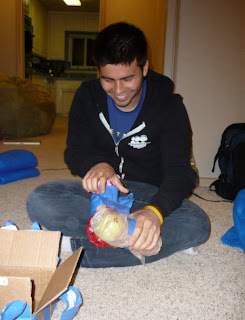 Thursday evening: I had a gift exchange with Jon, Mike and Sarah at Mike and Sarah's house and we had tons of fun. Jon and I played Super Mario on their Wii all afternoon and Sarah made plum chicken in the slow cooker. 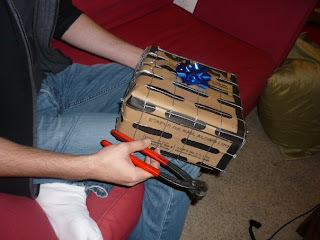 Mike and Jon have a history of wrapping things in ridiculously complicated ways (one year, Mike used an entire roll of duct tape). 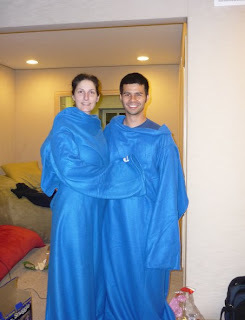 Jon and I have Mike and Sarah gag gifts (Snuggies) but they ended up liking them a lot! Friday: Christmas morning with immediate family, then movies with Dad and sister (saw It's Complicated, review here). Home for a bit, then dinner at my parent's house. Saturday: Jon and I went to South Coast Plaza to hit the Christmas sales. 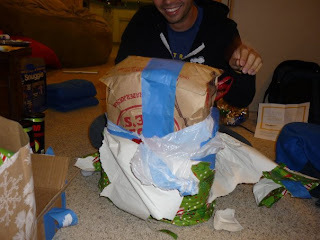 He got underwear, I got paper. Not an entirely successful operation. Then we came home and napped before Jon's dad came over to get help setting up his (point and shoot :)) camera. Sunday: Early wakeup, head to Laguna Beach at 8 am to videotape (me) and photograph (Jon) our friend's proposal. It was super sweet. :) We all had brunch, then took engagement shots by the water. Home to nap and then to Samy's Camera to find a filter and diffuser Jon wanted, followed by dinner with my family. Monday: After work, I went to Mike and Sarah's house and we had a lovely dinner of spaghetti, breadsticks, green beans, apple juice and a raspberry tart, all from Trader Joe's. They gave me instructions on how to feed her nano-tanks and kitty while they're gone (in Hawaii, those bastards!) and I met Sarah's sister who is moving from New York to Southern California. And by is moving, I mean, she arrived yesterday, then goes to Hawaii for the family vacation, and will then live in their house. It will be interesting having a new person around all the time; we're pretty close-knit and insular, but she seems nice (and she cooks!). :) After dinner, I went home and made a TON of new eensy-weensy cards. Hopefully, pictures and posting will happen tonight. Tuesday: That's today! So far, I am at work. Tonight, I will probably go to dinner with my parents and then work on more cards and posting. My shop has been neglected for too long! It has been a busy, busy time and to be honest, not necessarily a super joyful one. The past 2 weeks have been stressful and full of disappointments and revelations and many moments where I thought, "So, this is what being a grown-up is like." My hope is that things will look brighter soon! 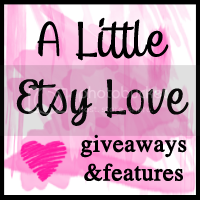 On Wednesday, at 8am, I will be posting info on my new giveaway, please come back and check it out! On Thursday, I'm posting a year-end recap and listing my resolutions (so you can help me keep them! ).